I nearly decided not to post this, but I realized Spicy San Francisco can’t only be about my ulcer-inducing successes. To be helpful at all, it needs to include it’s partly bland, semi-failures–which could describe this sandwich at A La Turca in the Tenderloin. It was my first visit to this restaurant and, given its proximity to Edinburgh Castle / Tuesday night trivia, it probably won’t be my last. It wasn’t a bad meal and the restaurant was cool in a Turkish-taqueria kind of way. But again, that isn’t the point of this feature. Also, I didn’t remember to take a picture until halfway through my sandwich. 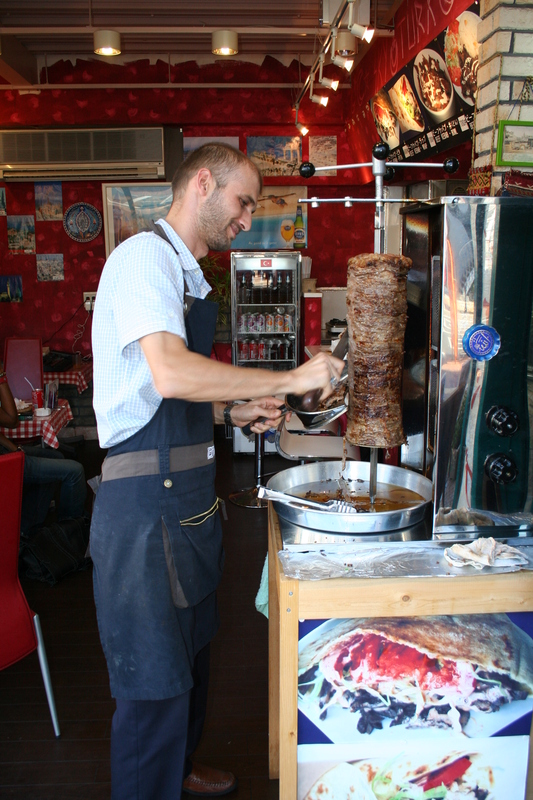 The best Turkish food in all of Japan! Make it spicy, please! When it comes to a Turkish meal, I generally stick to kebab plates and sandwiches, usually liberally covered in a spicy-yogurt sauce. Oddly enough, the best Turkish meals of life were in Japan. In Takasaki City, Gunma Prefecture, there was this happy man on the right. I’m not positive it’s still in business, but if you leave Takasaki Station on the west side and ask around, you should be able to find it. For two years, he made me delicious food and we practiced English and Japanese together. When I told him I wanted my sandwich spicy, it didn’t take long for him to learn what I meant. Within a month, he was making me dishes that weren’t even on the menu, using a sauce that ‘regular’ customers were not allowed to have. It was heaven, and I was forever spoiled. So when I stepped into A La Turca, I was quickly disappointed. When I asked what the spiciest thing on their menu was, I was told that nothing was spicy, but I could have hot sauce added if I wanted (I did). I asked if the hot sauce was harissa–and it was. On the table there was also finely ground red pepper flakes, so the potential for this meal to be amazing was still there. 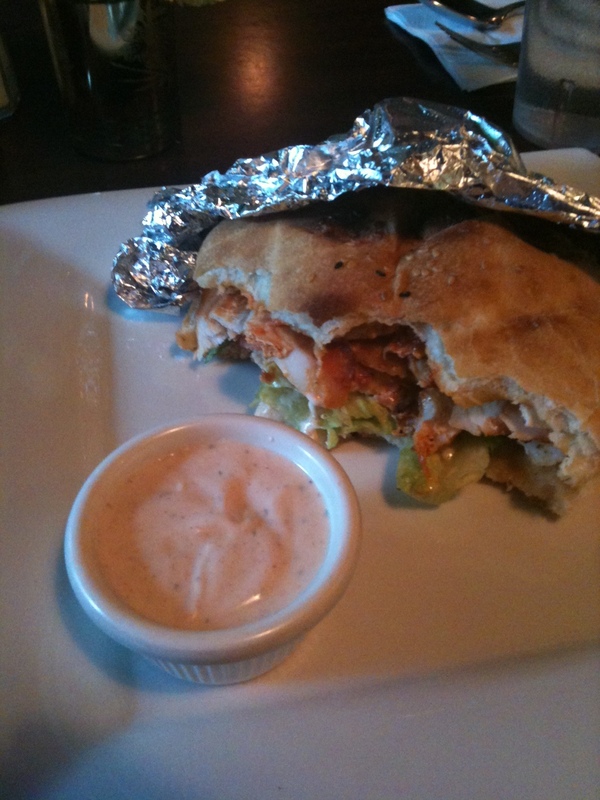 I went with something that would probably taste all right no matter what–chicken doner, with hot sauce, please! It was awesomely large and filling! This dish has a Z-Scale Score of -6, meaning it could have been significantly more spicy before it began compromising the flavor of the food. Like with some kebab sandwiches, the heat was not evenly distributed. After the initial bites, my score hovered around a disappointing -8. However, if I could give a score to only the last third of the sandwich, it might have been as high as -4. The last bite was quite enjoyable. The yogurt sauce, both inside the sandwich and on the side, worked to diffuse a lot of the heat–but this is normal with Turkish food. The included vegetables, namely the tomatoes and lettuce, also injected more water into the meal. In the end, I was not bored by this sandwich. A score of -6 is enough to keep me interested, and it did have some cumulative effect–a pleasant yet mild heat lingered for several minutes after finishing. If I return to this restaurant, I know to ask for my food to be very spicy and request a side of hot sauce. I heard someone ask for this as I was leaving, so i know it is possible. I wonder if I had asked for only hot sauce–and none of the yogurt–would I have been scolded by the Turkish chef?